Our school provides many opportunities for your family to be connected with other families throughout the school year. 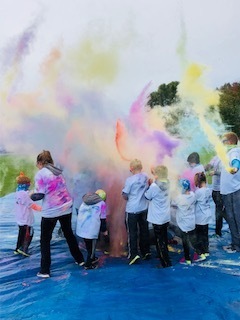 Some of the regular activities that the St. Paul family comes together for are: Fall Pig Roast and Auction, 5k Color Run in the community of Stevens Point, Board Game Night, our School Dance, the ever popular - Winter Carnival, Skating and Sledding Nights, just to name a few. Please come and get involved in YOUR PTL! Along with our teachers, we are always looking for parents to assist and/or coordinate these events for our school. Many hands make light work!